And so the chopping begins. C’rizz, all round irritant and obstacle to proper character development, is no more. He is an ex-companion. Woo hoo! A holdover from the weirdy “Divergent Universe” era of eighth Doctor stories, it’s slightly fitting that his final story should be another weirdy alternate universe piece that explains at last the slightly uninteresting secret he’s been carrying with him ever since his exodus. Trouble is it’s also a fittingly uninvolving story, full of interesting ideas that somehow fail to lift off thanks to the usual infusion of gobbledygook, poorly explained concepts and a resolution that’s somewhat incomprehensible. It would be unfair to see it’s irredeemable. 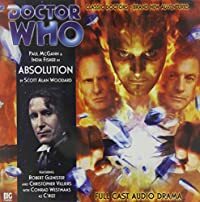 Paul McGann, after a slight bit of sleepwalking through some of the recent episodes, edges nearer to consciousness in this. India Fisher does an excellent job playing a character called Charley who appears to have no resemblance to the actual Charley we’ve come to know and love. And Robert Glenister, despite now sounding exactly like his brother Philip (you know, Gene Hunt on Life on Mars), is suitably scary as ‘Aboresh’. There are also some interesting concepts at work in the general set-up for the story, with hints of The Mind Robber as the TARDIS melts and turns to stone among other things, although it’s a bit closer to Event Horizon for the most part. Unfortunately though, it’s just a load of ideas desperately searching for a decent frame to hook themselves on – even to the extent of having a self-acknowledged deus ex machina save the day at the end without any work from the Doctor. None of the characters seem especially well motivated or well depicted. And C’rizz’s deep dark secret is just arse and has been done a dozen times before to equally poor effect. As for poor Charley, all she gets to do is run around a lot, talk a lot like a posh girl (although not one from the 1930s – 1990s more like it) before going absolutely mental at the end for no reason other than they’re going to write her out in the next story. Still, it’s the closest we’ve had to decent Doctor-companion interplay for quite some time. On the whole then, not one to splurge on unless you fancy waving goodbye to C’rizz. Thank God I’m not going to have spell that one again. How much should you have to pay for it?